I Love You More Than Carrots: #DocumentingLifeChallenge, A Fun Instagram Photo Challenge! #DocumentingLifeChallenge, A Fun Instagram Photo Challenge! It's no secret that I love taking pictures, and not just pictures, but pictures of my kids. As moms, we know all too well how fleeting the moments are and how quickly children grow up. We struggle on the daily to capture them as they are before they get their first tooth, before they grow taller, before they stop saying their L's as W's. Before we know it, we're in line for kindergarten registrations and signing them up for sleep away camps. But in the mean time, we take pictures. If you love taking pictures just as half as much as I do, if not more, then you'll love this challenge that originally began with one of my favorite mothers, bloggers and mom-tographers, Jenny Collier. What originated on her blog a few years back has now transformed into an Instagram challenge with the help of myself and Erin, from Hello Erin. Since we spend most of our days in the trenches, picking up our digital SLRs isn't always the easiest, despite how often we wish out loud that we had "just a few more 'nice' pictures of our kids." Instead, we grab whatever is nearest and 9 times out of 10 that's our iPhones. So grab your camera phone. Be inspired by our prompts. 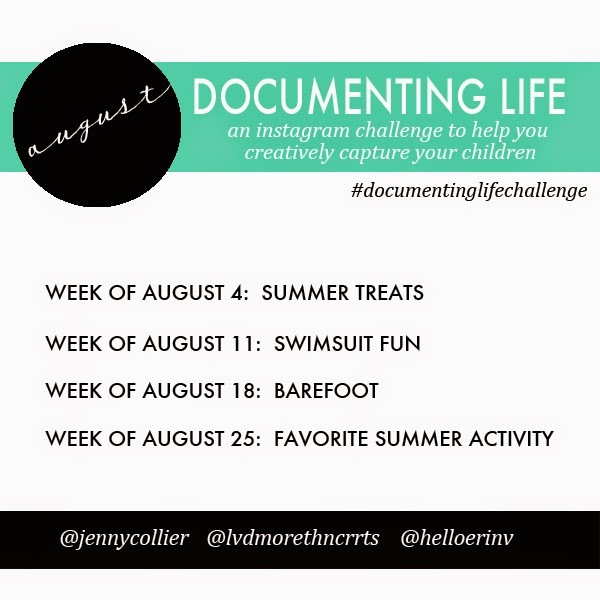 Take more pictures of your kids and share them on Instagram with us, using the hashtag #documentinglifechallenge. If you're looking for a few good editing apps, I recommend PicTapGo and Adobe Photoshop Express. For those "sweet extras" like fonts and designs, should you want to add them, check out Rhonna Designs. Be sure to follow myself, Jenny and Erin on Instagram. With each new month we'll be sharing the photo prompts and encourage you to do the same! Then take one photo each week using that week's prompt and upload it to Instagram using the hashtag #documentinglifechallenge. We really hope you'll join us in this little challenge. Get creative- we can't wait to see what you come up with! I plan on taking this challenge and turning it into a photo book at the end of the year! Week of July 13: Your choice – what do you want to remember about your child at this stage? Kinda really extremely excited for this challenge. Maybe just maybe I'll learn my way around the "almost as frustrating as real photoshop" photoshop app... MAYBE.